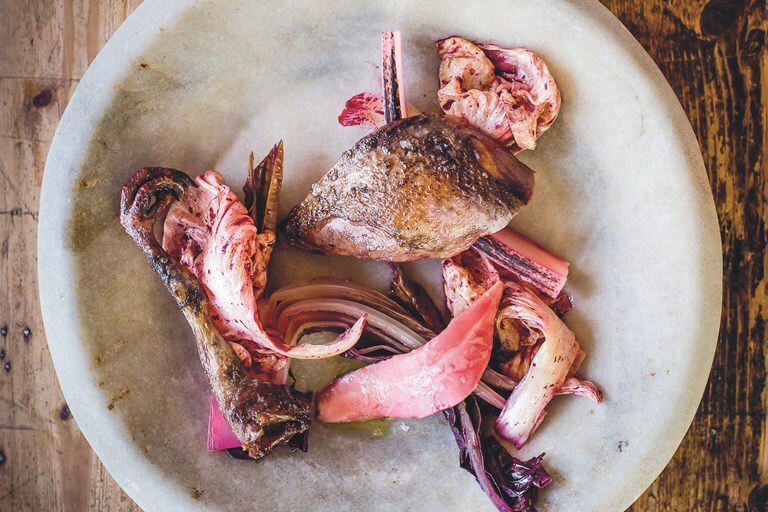 Robin Gill's gorgeous dish of roasted wood pigeon is served with marinated rhubarb, chicory, and a delicious sauce made from the offal of the birds. Robin recommends squeezing the bird carcasses over the plates at the table – a fun if macabre way to finish a dish. This recipe was taken from Larder by Robin Gill, published by Absolute Press. Photography by Paul Winch-Furness. Arrange the drained chicory and rhubarb on each plate, followed by the pigeon breasts and legs, and the heart and liver sauce. Take the bloody carcasses to the table and hand-squeeze over the entire dish. It’s bound to cause a stir!